bethesda | MSRcast and Metal Geeks Unite! 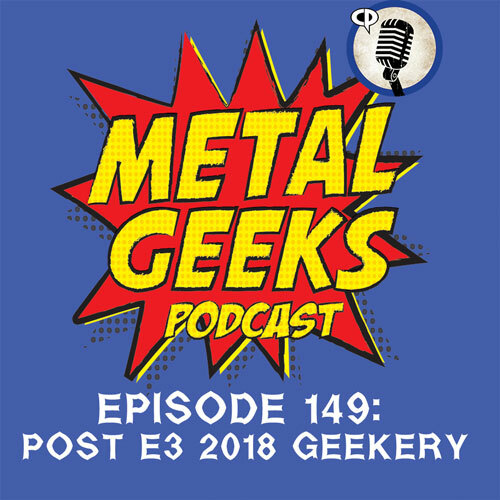 Join your hosts for a brand new episode of Metal Geeks as we discuss our favorites from this year’s E3 conference, jam some Alkaloid during George Hates Metal, as well as some discussions on Solo: A Star Wars Story and much more geekery! Join your hosts, Cary the Metal Geek, and George as they invite to the show special guests JD aka S3Prototype from Ultness.com and the voice from the other room, Kim AKA Kimmu Borgir who happens to be the other big gamer at the Metal Geeks Studio. Join us as we discuss and pick apart our favorite press conferences, and talk about our favorite games from the show. Can you guess what they might be? Join us on our website at www.metalgeeks.net to keep up with all the geekery. Follow us on twitter, @metalgeeks, and @msrcast. You can now find us on Instagram, @metalgeeks. Find us on Facebook/MetalGeeks. Subscribe to Metal Geeks Podcast on iTunes, and leave a review and a like us whilst you are there. You can also find us on Stitcher! Don’t forget to pay a visit to all of our affiliates including Ultness.com, Lightening Radio, Nerdbong.com and ESOpodcast.com, your home for all of our Metal Geeks Shenanigans! Catch you on the next episode, and Keep It Geeky!